Run time: 5 hr. 20 min. 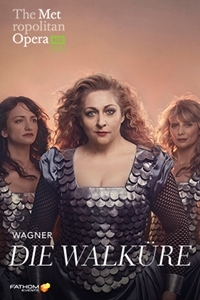 Synopsis: Fathom Events and the Metropolitan Opera present a broadcast of Wagner's Die Walküre, live in select cinemas nationwide on Saturday, March 30. In what is expected to be a Wagnerian event for the ages, soprano Christine Goerke plays Brünnhilde, Wotan's willful warrior daughter, who loses her immortality in opera's most famous act of filial defiance. Tenor Stuart Skelton and soprano Eva-Maria Westbroek play the incestuous twins Siegmund and Sieglinde. Greer Grimsley sings Wotan. Philippe Jordan conducts.